Breyer Horse Collecting: Hard To Find Models Now In Stock! Golden Oak Stables is proud to announce that three hard to find models are now back in stock! Better yet, order today and you can still get your models in time for Christmas! Only available through the second half of 2010 is Cloud Nine. 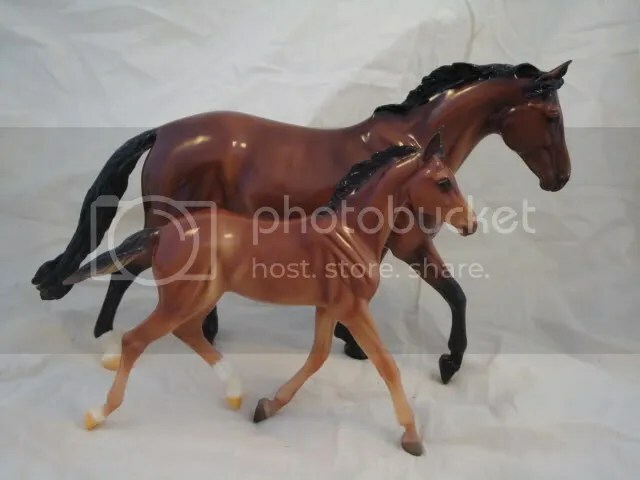 This stunning warmblood stallion is done on the popular Keltic mold sculpted by Brigette Eberl and painted in a beautiful pinto, sure to please any collector. Chosen by collectors as the collectors choice for fall 2010, this model has been exceptionally popular and is sure to become highly prized down the road! He also makes a nice stallion to complete out your warmblood family with GG Valentine and Heartbreaker! All are sculpted by Brigette and make a stunning family portrait! The new mold and model S’Justadream is a portrait of the stunning Arabian halter champion! This chestnut filly is not only adorable as can be but a wonderfully fun and fanciful model sculpted by the amazing Kathleen Moody. Kathleen has designed dozens of models for Breyer, many of which became some of Breyer’s most beloved molds. This petite and sweet Arabian filly has the most beautiful expression and a beautiful, long mane and tail that make her pretty as can be! On the western front, Big Chex To Cash is a big name in the reining world and has shaken up not only the reining ring but also the Breyer show ring! Big Chex To Cash is one of the most exceptionally painted Breyers created ever and he’s available to everyone! From his slightly metallic color to his beautiful dapples that dance across his coat he’s painted exceptionally! He has exquisitely detailed paint markings and even features his stable brand! Big Chex To Cash is truly a one of a kind horse and Breyer and is sure to be a favorite for years to come! Finish off your holidays with Golden Oak Stables and you’ll be sure to please, especially with these difficult to find and highly desired models! Stable News will be away until the new year, so we’d like to wish you a very wonderful holiday and a very happy new year! Breyer Horse Holiday: Still Plenty Of Time For Christmas Shipping! Don’t delay, there’s still plenty of time for Christmas shipping from Golden Oak Stables! That’s right, you can fill those stockings with Stablemates and stuff that tree with Breyer ornaments with time to spare! Christmas may have snuck up on us, but with snow covering about half the country there’s nothing better to do than shop from the comfort of your own couch and if you have a Breyer lover on your list, you can come right to Golden Oak Stables for every Breyer need! Order before December 16th and your order can arrive almost anywhere in the United States by Christmas, you can take a look at the shipping map to find where you are and the estimated shipping time from the Golden Oak Stables warehouse! Bring home some of the most popular items for your Breyer collector this holiday, like the 2011 new releases! These early releases are filled with adorable mare and foal sets and a 10 piece stablemate set that is cute as can be and has a shadowbox that can be hung on a wall! There’s also Kong, a percheron horse from the famous Preifert hitch, GG Valentine and Heartbreaker and Kripton Seni II! You also can fill out your Breyer Holiday 2010 collection still! These limited run items will only be available this 2010 holiday season and are sure to become difficult to find just as in years past! You can still grab Jewel, the 2010 Holiday horse, a stunning buckskin warmblood that is exciting as can be! There’s also a sweet Waiting For Santa set that has an adorable foal, doll and accessories! There’s a myriad of ornaments still available too including everything from famous racehorses to decorative artist renditions! Check out the Holiday 2010 section today! So don’t delay! You can still bring home the most beautiful and wonderful model horses to that special someone on your holiday list with Golden Oak Stables, so head on over today! Breyer’s 2011 sneak peeks are in stock and popular as ever! One of the most exciting releases in a long time is that of GG Valentine and Heartbreaker. 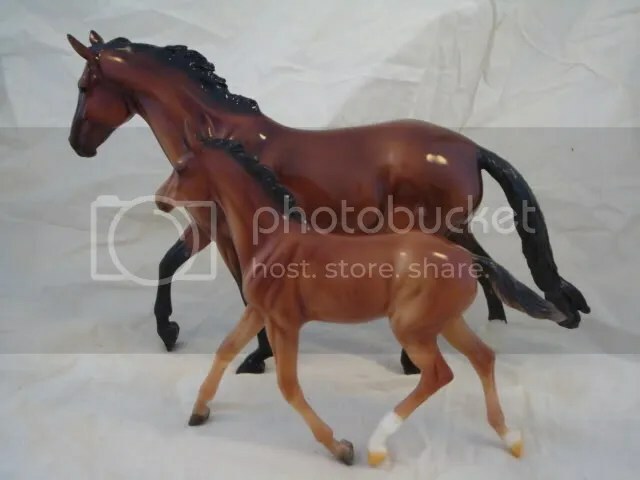 This mare and foal set are the portrait of two wonderful real horses and are done on two new molds that are sure to excite nearly every Breyer collector! GG Valentine is the portrait of a champion hunter mare that was named after a beloved grandmother, Gramma Gail, who was born on Valentines day. Throughout her life she was trained and ridden by Jennifer Alfano and would make their way to Devon, a world class show where they would win big! She then went on to light up the show ring wherever she went and proved herself worthy in just about any hunter ring that they would encounter. In 2007 GG was retired at Devon but had gained the legacy of winning major championships at many of the top shows in the nation! On New Years Day of 2010, her foal, Heartbreaker was born and is sure to be a champion in training. Sired by Oh Star, who has some striking Olympic connections, Heartbreaker is ready to win and already starting to train! Breyer has created this exciting pair on the Giselle and Gilen molds sculpted by Brigitte Eberl, a German artist with a huge hobby following. Brigitte’s sculptures are seen by many as some of the most realistic and conformationally correct models around. GG Valentine and Heartbreaker are the first regular release of these molds and they’ve become fast favorites already! This pair is done in the portrait colors of Valentine in a beautiful reddish bay and Heartbreaker in a perfect baby bay. Valentine features truly stunning facial markings including a very detailed stripe and a tiny snip and Heartbreaker has two socks which accent his beautiful coat. Valentine even comes with a stunning detail: her brand is expertly painted on her hip! Making things interesting for collectors, Breyer has not only released a regular run version of GG Valentine and Heartbreaker but also a hard to find and limited glossy set of these beautiful models! Either set is sure to please, whichever your preference, and Golden Oak Stables has both versions available. But act fast, they might not be around for long! 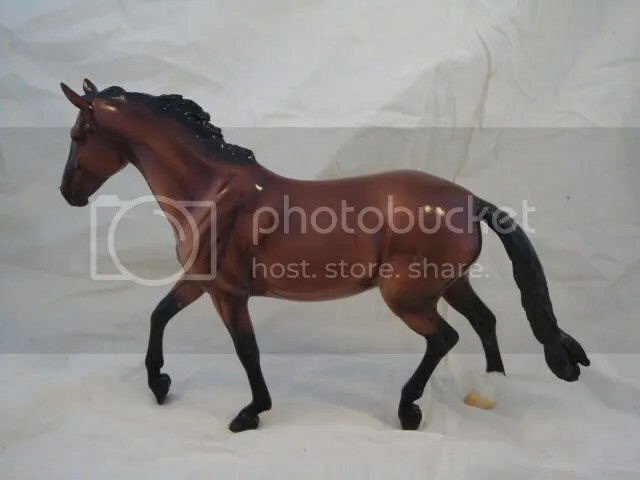 Breyer Horse Holidays: Retired and Hard To Find Stock! Breyer releases a large variety of wonderful holiday items each and every year, and if you are like me, you can’t always get every piece you would like. Well, Golden Oak Stables comes to the rescue! They have a large selection of retired Holiday items ready to complete your Breyer holiday collection! From ornaments to sets, Golden Oak Stables’ Retired Holiday outlet is simply stuffed to the brim with a huge variety of Breyer Christmas favorites. You can still complete your Holiday Horse collection with Noel, the beautiful cream colored draft horse with a gorgeous holiday outfit and is ready to canter into your home! 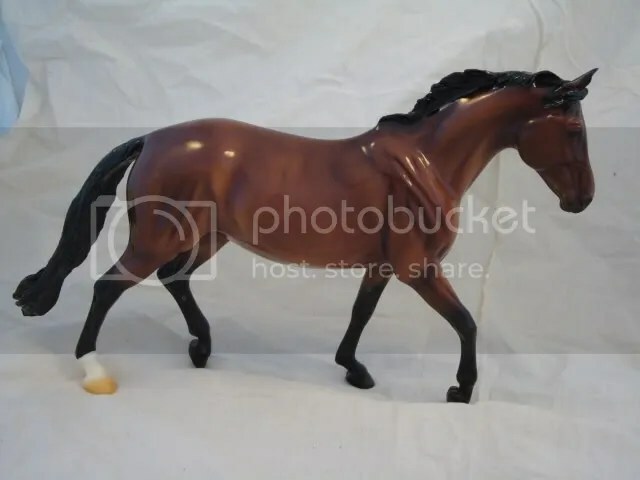 You can also still bring home Nutcracker Prince, the Huckleberry Bey holiday horse from 2009! This high prancing, bright white, Arabian stallion wears a bright green costume that carries ornaments from The Nutcracker. You can still wait for Santa as well with Breyer’s Waiting for Santa set. This sweet set includes everything to make every little girl’s dream Christmas seem real. With a little girl dressed in her red horse pajamas this set creates the perfect image of Christmas morning, right down to the miniature horse that the girl finds waiting for her under her tree! Ornaments also abound through Golden Oak Stables, and one of the hardest to find series is still available! The Beautiful Breeds set is one of the most collected Breyer ornament sets and you can still bring home two of them! The Clydesdale is an amazing porcelain rendition of one of the most astounding breeds around. This gentle giant even wears red and green ribbons for the occasion! The Beautiful Breeds Andalusian from 2009 is a stunning portrait of this amazing Spanish breed. With his high gaited walk and his authentic Spanish outfit, the Andalusian is a beauty in grey that will brighten up any tree! No matter what your taste, there’s a holiday horse for you! From Traditionals all the way down to ornaments and accessories, the Golden Oak Stables Holiday Outlet is stuffed full! Take a look today! Breyer Horses: Golden Oak Stables’ Vintage Outlet! Looking for something special? Perhaps a special gift that no one else will be able to get? A new show horse that you can’t find just anywhere? Well have you checked out the Golden Oak Stables’ Vintage Outlet recently? Golden Oak Stables’ Vintage Outlet is stuffed with pristine, unopened, retired Breyer horses, and these are just a few of them. Created by the beloved Kathleen Moody, Romance is a beautiful and fanciful Huckleberry Bey done in a fantasy theme. With images of princesses and princes, as well as other fairy tale scenes, Romance is sweet as can be and an amazing decorator to boot. This wonderful horse is difficult to find and quite unique, it is the only decorator that Breyer has created with such an elaborate scene! The classic story of Justin Morgan is created on a stunning prancing Morgan fondly known as the Sherman Morgan mold and includes a copy of this wonderful novel. Considered one of the most important breeds in the United States, the Morgan is a popular and cherished by many people! You can bring home the story of the first Morgan as well as a beautiful Breyer created in his likeness. If you’d really like to put a present under the tree that will brighten anyone’s tired eyes on Christmas Morning, the Pegasus Treasure Hunt Set is a set of five models, four mustangs and a Pegasus. The four mustangs include a red dun appaloosa, a metallic dun, a bay pinto and a stunning rose grey. These for models were required to redeem for the coveted Pegasus, which is included in this set! This difficult to find set will surely become a beloved part of any collection. No matter what your collection looks like or what your favorite model is, any of the wonderful models in the Vintage Outlet will make your collection that much more special! Bring home a special piece today! You are currently browsing the Stable News blog archives for December, 2010.